It uses animal cells, but producing it does not harm animals, or require us to get anything from animals (beyond the cell line, which already exists). The cell culture is fed using a plant-based medium, and grows indefinitely. Since no animals are harmed, it complies with vegan ethics. Thanks for this! I hope you’ll do a 2016 update as well, but this was helpful in contacting my Occupational Health department. I agree that we should be supporting the development of medicines and vaccines that don’t use animal products, and it is great to see steps in this direction. At this point, I probably won’t get to a 2016 update. My wife and I have been busy preparing for our first child, due any day now. Target no longer carries FluBlok. I’ve been told that some Targets carry FluCelVax, but the ones I called did not. Passport Health also no longer carries FluBlok. Some pharmacies carry FluBlok or FluCelVax, but it’s on a branch-by-branch basis, and generally requires a special order. 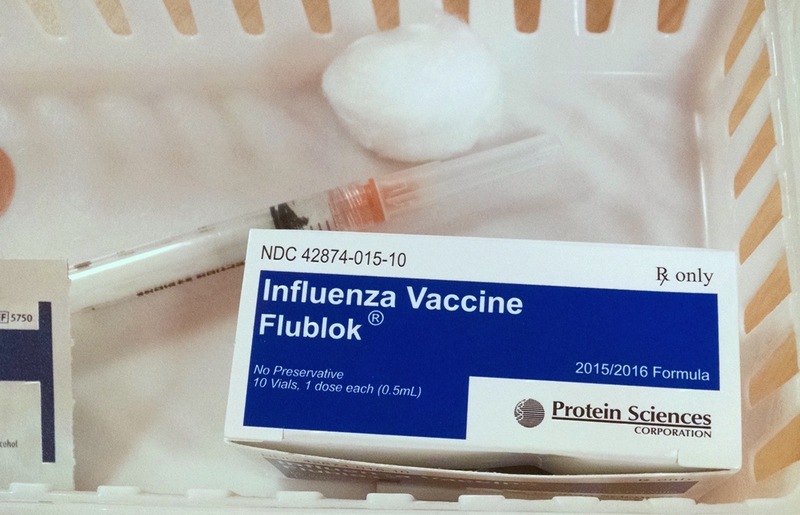 FluBlok’s vaccine finder page seems to be up to date, but call to check. Many are special-order only, requiring you to visit twice. I live in the San Francisco. The only* source of vegan flu shots I was able to find in the city is the San Francisco Department of Public Health. They were super helpful, answered my questions, and did not require any special orders. They do not accept insurance (you’d have to file a claim separately), but they say that may change by next year. Vegan flu shots in SF are unusually scarce this year. The cities and suburbs around SF — Oakland, Fremont, Pacifica, the peninsula, the north bay — all have options. I have no idea why this is, given that SF is a population center. For whatever reason, more suburban places in the area seem to have more options. It’s worth calling around, if only to demonstrate that there is interest. You also may get lucky — I didn’t know that SF DPH had a vaccine clinic until I called a pharmacy that did not have vegan flu shots, who recommended that I check with them. * Kaiser Permanente is rumored to have FluBlok in SF as well, but I am not a member, and can’t confirm this. I realize this is late but in case somebody finds this (incredibly helpful) post in the future: I have been getting FluBlok at Kaiser in the San Francisco Bay Area (specifically in San Mateo) for the past 3 years. They never give me a hard time when I say I want it because I’m vegan. Ed, I hope things have been going well with your child! Thank you for your incredible work here.